Standard ticket prices for performances at the Donmar are £40, £30, £20, £10. Every Monday, short notice tickets are released at noon – for performances two weeks later – at each price band. 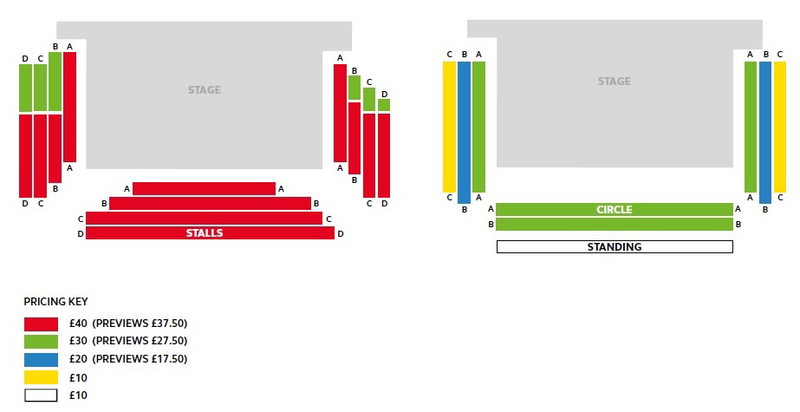 So that as many different people can see the show as possible, you can only book one pair of tickets per production. There is very high demand for these tickets. If you are not successful on your first attempt, don’t forget we release more tickets every Monday. These tickets are only available online. There will also be additional surprise releases of KLAXON tickets. Follow us on Twitter or sign up now for email alerts about our KLAXON tickets. YOUNG+FREE is a unique, free ticket access scheme for 25 year olds and under. We release a number of free tickets at the end of every month for the following month’s shows. To ensure fair access to tickets, YOUNG+FREE tickets are offered by ballot to people signed up to our YOUNG+FREE list. To enter, simply sign up for YOUNG+FREE email alerts. If you are already on the list, you have already been entered into the ballot. Ballot winners will be notified at the end of each month with details of how to claim their tickets for the following month’s performances. YOUNG+FREE is made possible by PAY IT FORWARD and the generosity of those who have donated. Find out about how you can donate and PAY IT FORWARD to the next generation of audiences. A small number of standing tickets is available from 10.00AM on the day of the performance. These can be booked online or in person at the box office. Standard ticket prices for the first four previews of each production are reduced by £2.50. For over 60s: £40 tickets are reduced to £32.50 and £30 tickets are reduced to £25 (matinees only). For disabled patrons: if you require a companion to attend the Donmar, their ticket will be free. See our Access page for more details on how to book. Wheelchair and accesss ticket bookings can be made online, by telephone on 020 3282 3808 or in person. A fee of £1 will be applied to your order if you choose to have your tickets posted to you. There is no charge for e-tickets or for collecting your tickets from the box office. Tickets cannot be refunded unless a performance is cancelled or abandoned when less than half the performance has taken place. We will not be liable for travel costs or other expenses incurred as part of your visit to the Donmar Warehouse. Tickets can be exchanged for the same production up to 72 hours in advance, subject to availability. If an event has sold out we can attempt to try and re-sell your tickets once we have sold all of our own available tickets, including any last minute holds we may have. Please note that we cannot guarantee the re-sale of your tickets. If they are re-sold, you will be contacted by the Box Office. We reserve the right not to accept tickets for re-sale. Reselling a ticket for profit or commercial gain makes it void. The Donmar will cancel your booking and the ticketholder will be refused entry. The Donmar will blacklist any buyer if the buyer resells or offers for re-sale any ticket through a secondary ticketing facility as defined in the Consumer Rights Act 2015. Please see our full Terms and Conditions of sale.